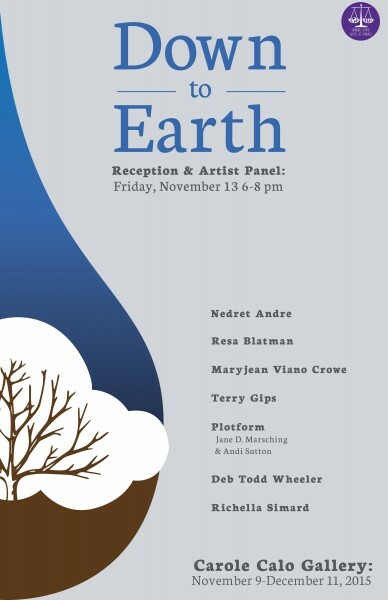 The Carole Calo Gallery at Stonehill College is pleased to present Down To Earth, featuring the work of Nedret Andre, Resa Blatman, Terry Gipps, Plotform (Jane D. Marsching and Andi Sutton), Richella Simard, Maryjean Viano Crowe, and Deb Todd Wheeler from November 9th- December 12th. In an effort to inspire action, Down to Earth acts as an environmental microcosm, a more intimate and isolated glimpse into the relationship between the earth and its inhabitants, and most importantly, how that relationship is steadily deteriorating. Upon closer examination from the diverse perspectives these artists present, from under the sea to on the dinner table, the viewer encounters disturbing realities about the tarnished state of our ecosystem. By starting a conversation about the negative consequences of human actions, we become aware of our symbiotic relationship in this realm. Striking installations, highly stylized and abstract paintings, manipulated found objects, Scherenschnitt paper cuts, and larger-than-life photographs immerse the viewer in a new reality that is impossible to ignore: to lose the land is to lose ourselves. Down to Earth acts as both a classroom and a call to action, eliminating the passivity of merely viewing a work, and instead challenging the viewer to nurture nature before it is too late.